The labor market in Israel is moving from a traditional economy to one of information technology and modern services. As a result, some occupations are at risk of automation, that is, the workers currently employed in these positions are likely to be replaced by machines or computers. 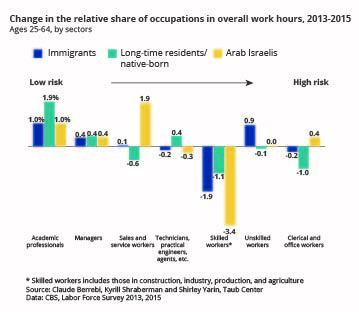 A new Taub Center study by Prof. Claude Berrebi and Kyrill Shraberman finds that in the past few years there has been a decline in the share of workers in high-risk jobs, although this decline has been less among Arab Israelis and immigrants than among the long-time resident and native-born Jewish working population. The study also finds that the return on education has risen since 2003, particularly among women. Between 2013 and 2015, there was a rise in the relative share of workers in occupations at low risk of automation, and a decline in the share of occupations at high risk. In the Arab Israeli sector, there was a rise in the share of workers in occupations at relatively low risk, particularly workers in sales and services. In contrast, among immigrants, the share of those working as unskilled workers (classified as high risk) among workers aged 45-54 who came to Israel at the beginning of the 1990s has increased, something that may indicate difficulties in their integration. The hourly wage difference between those with 18 years of education and those with 12 was about 35% among men and about 40% among women in 2014 – an increase relative to 2003. The smallest wage difference between education levels was among immigrants. In the Arab Israeli sector, workers’ skill levels are relatively low: the share of those with high-level skills in reading comprehension and mathematics is only 1% in contrast to 10-13% in the Jewish population (according to the OECD PIAAC Survey – Programme for the International Assessment of Adult Competencies). In the past few years, there has been considerable debate on the subject of occupations at risk of disappearing from the labor market as the result of modernization processes, as seen in the move from a traditional economy where manufacturing and production are the engine of the market, to an information technology and services economy, where high-tech and services are the major growth engines. A new Taub Center study by Prof. Claude Berrebi and Kyrill Shraberman adds another layer to this debate and examines the trends in the risk of automation in the economy between 2013 and 2015. The study looks at changes in the relative share of various occupations in the market place and presents the changes by the risk-of-automation ranking of the occupations. The changes are presented for the entire economy, and also broken down into men versus women as well as between selected population groups (Jewish long-time residents/native-born, Arab Israelis and immigrants who came to Israel since 1990). The study finds that the relative portion of workers in low-risk occupations has risen, while the share of workers in high-risk occupations has declined – evidence of a continued labor force modernization process. The changes among women were greater than among men, primarily due to an increase in the share of workers in academic professional occupations. At the same time, the share of clerical workers has declined overall – occupations in which the share of women has been particularly high. Berrebi and Shraberman also found a significant decline in the share of women employed in these occupations – a process that might indicate that certain administrative positions have already undergone the process of automation and computerization (as evidenced by bank branch closures, outsourcing of secretarial services, and computerization of office administration activities). The rise in the share of low-risk job positions, resulting apparently from increasing demand for workers in jobs requiring high skill levels, influences the average wage. The Taub Center study findings show that in the Arab Israeli sector there has been a decline in the share of skilled workers in production and manufacturing (considered at high-risk of automation) and a relatively strong rise in their share in sales and services as well as in clerical work, occupations at lower risk. A possible explanation is that the process of automation has meant that unskilled, though low-skilled workers have moved from manufacturing, production and construction work to work in sales and service. There was a small change (an increase of 1%) in the share of Arab Israeli workers in occupations requiring an academic education. This is low relative to the Jewish population (an increase of 1.9%), and as a result, the average wage rise was also lower among Arab Israelis. A possible reason is the relatively low skill level within the Arab Israeli sector: the share of those with high level skills in reading comprehension and mathematics among Arab Israelis ages 16-64 is only 1%, versus 10-13% among the Jewish population (according to the PIAAC survey of adult competencies). An additional explanation is that the process of automation has meant that unskilled workers have moved from manufacturing, production and construction work to work in sales and service. Among immigrants, there has been a rise in the share of skilled workers and a smaller increase in the share of workers in academic professions (relative to long-time residents/native-born). Women who came to Israel since 2008 have particularly high employment rates as unskilled workers in almost all age groups. Their chances of improving their situation and moving from high-risk low-pay employment to more lucrative lower risk occupations over time are greater than men’s chances. The major impediments to immigrant integration in the labor market are language issues – Hebrew and sometimes English. Immigrants in general, and women immigrants in particular, are characterized by higher rates of higher education that do not match the local labor market. Thus, they often compromise by accepting employment in occupations that do not require an academic education. That said, immigrants are employed at slightly higher rates than Jewish long-time residents/native-born Israelis. The second part of Berrebi and Shraberman’s study deals with changes over time in returns to education. That is, to what degree does a year of formal education improve hourly average wages (controlling for additional worker characteristics like potential experience, sector and occupation). The findings show that since 2003, there has been an overall rise in returns to education. This increase encourages workers (primarily younger ones) to attain more education, thus improving the quality and skill level of the labor force. The rise in return to education also contributes to increasing wage gaps between workers. In 2003, the hourly wage for men with 18 years of schooling (equivalent to a second degree) was about 31% higher than wages for those with 12 years of schooling (equivalent to a high school diploma or matriculation certificate). In 2011, the gap was about 40% due to a rise in the contribution of years of education to workers’ wages. In 2014, the gap was 35%, that is, higher than in 2003 but lower than in 2011. The narrowing of the gaps between 2011 and 2014 was primarily due to a rise in wages of men of all education levels and a drop in the return on years of education to wages. Among women, the gaps in the correlation between hourly wage and education in 2003 between those with 18 years of schooling and those with 12 years was about 27%. In 2011, the gap increased to about 37% and in 2014, it was about 41%. According to Berrebi and Shraberman, the reason for the rise in the gap was changes in the mix of occupations that women are employed in between 2003 and 2014. Among Arab Israeli men, the wage gap between educated workers and those with less education was similar to the overall wage gap in 2003. By 2014, there was a decline in this gap in contrast to the overall trend seen among men. The difference lies in the fact that the rise in wages over those years for Arab Israeli men was more moderate than among the general male population. Thus, the returns on education remained lower. Among immigrant men, there was also a rise in returns to education, although the gaps remained lower than among the general male population. Wage gaps among an immigrant with 18 years of schooling and one with 12 years of schooling were only 14% in 2003 and 22% in 2014. Differences in the distribution of occupations among immigrants and Jewish long-time residents/native-born had a considerable contribution to the differences between these groups. The relative share of immigrants in low-wage occupations was higher relative to long-time residents/native-born as was the share of those with an academic education employed in occupations with middle to low wages. Thus, returns to education were lower among immigrants. A different trend is seen among immigrant women. In this group returns to education declined between 2003 and 2011 due to a rise in the relative share of women employed in middle to low-wage occupations (sales and services, clerical workers, technicians) and a decline in their share in skilled occupations, unskilled occupations and managerial positions. In contrast, between 2011 and 2014, there was an increase in returns to education among women immigrants as the result of a rise in the share of those employed in academic professions, a continued rise in their share in employment in occupations like technicians and a decline in their employment in clerical work. Among other things, the rise was thanks to women who were younger when they immigrated and whose skills and education match the Israeli labor market. Since the beginning of the 2000s, there has been an observable trend of a narrowing of the wage gap between high and low wages, although since 2013, there has been a widening of this gap in the labor market. Inequality is expressed in wage gaps between Jewish long-time residents/native-born and Arab Israelis and between immigrants and Jewish long-time residents/native-born. In an examination of trends over time, the gap between Jews and Arab Israelis was found to be quite stable while the gaps between immigrants and long-time residents/native-born narrowed. This was primarily due to high levels of employment of immigrants and an improvement in the occupation mix over the past few years, especially among immigrant women. High levels of employment of immigrants might contribute to narrowing of labor gaps too. The Taub Center for Social Policy Studies in Israel is an independent, non-partisan socioeconomic research institute. The Center provides decision makers and the public with research and findings on some of the most critical issues facing Israel in the areas of education, health, welfare, labor markets and economic policy in order to impact the decision making process in Israel and to advance the well-being of all Israelis.